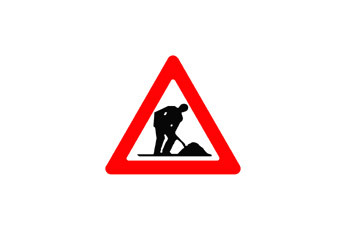 Before you is traffic sign 126. 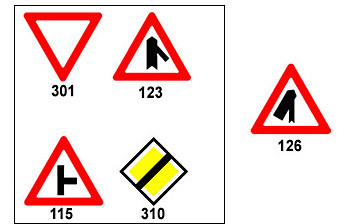 Which traffic sign should be placed in the road with which you are about to merge? 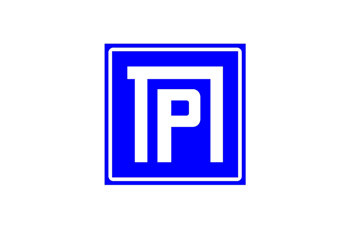 Authorized parking space for public vehicles. 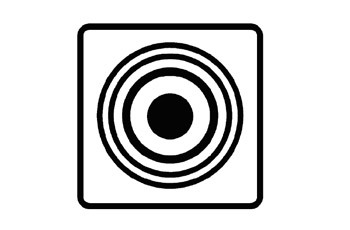 Beware, authorized shooting range location. You are approaching a local train station. City / Settlement / Region center. End of 30 k.p.h zone. Recommended speed of at least 50 k.p.h. Beginning of 30 k.p.h zone. 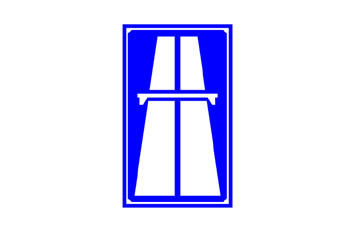 An area of at least 30 k.p.h. Beware! 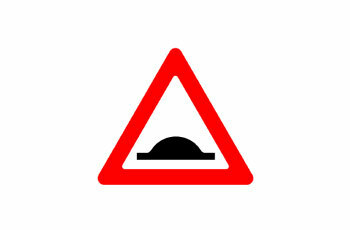 Speed restriction bumps on the road ahead. Beware ! Obstacles on the road. .
Until the nearest intersection or until a “no parking” zone. Until a “no entry” sign. Until an “end of urban road” sign. Separate bicycle paths on a freeway. Joint path for cyclists and pedestrians. Drive normally. 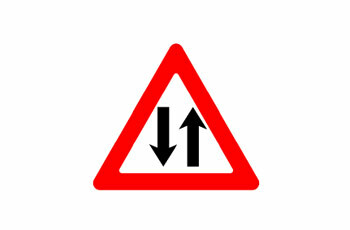 The drivers from the opposite direction should give you right-of-way. 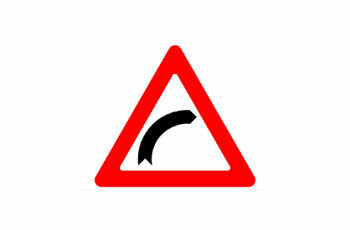 Stay on the right of road and pay attention to incoming traffic from the opposite direction. 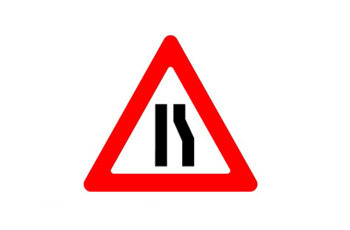 Stay on the right lane because overtaking is prohibited. 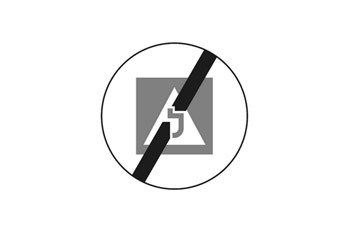 Drive faster in the narrow road section. 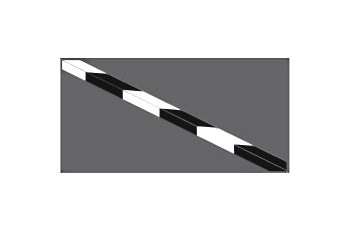 What is the meaning of the black-white marking besides the road? 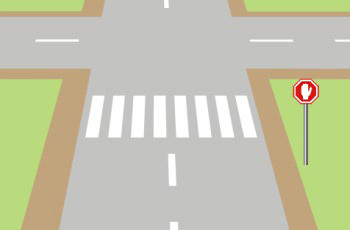 The marking emphasizes the presence of sidewalks and traffic islands next to the road. Stopping and parking place before a level crossing. Stopping and parking is absolutely prohibited. Parking space regulated by the local authority. 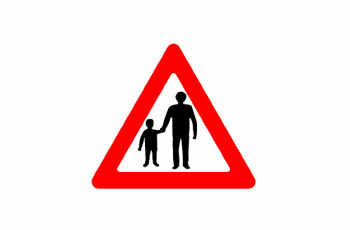 Slow down and be ready to brake or turn to avoid the pedestrians in the vicinity. 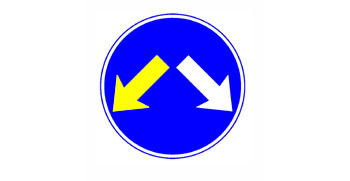 Give right-of-way to traffic from the opposite direction. 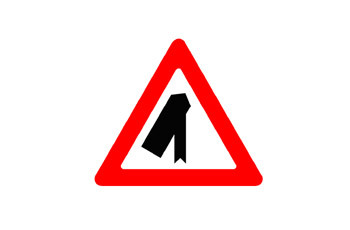 Drive faster and cross the place quickly. Honk continuously before the road sign. 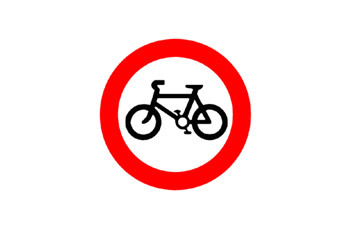 No entry for bicycles and motorcycles. 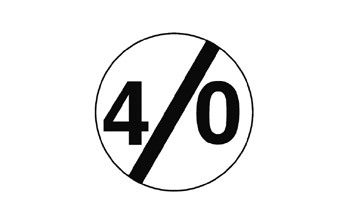 No entry for four-wheeled motor vehicles. 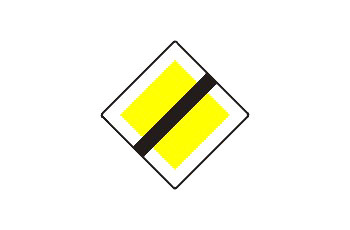 Pass only from the right. Only public transportation is allowed to pass from the left as well. 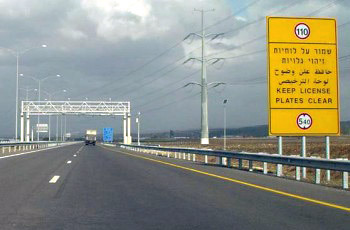 Pass only from the left. 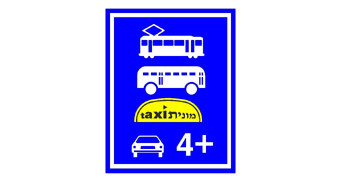 Public transportation is allowed to pass from the left as well. 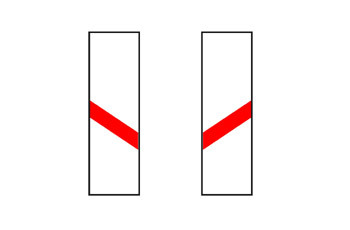 Pass from the right or from the left; whatever is comfortable for you. 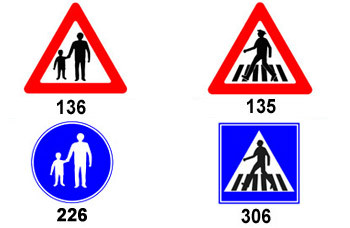 Which of the following traffic signs means “pedestrians in the vicinity”? 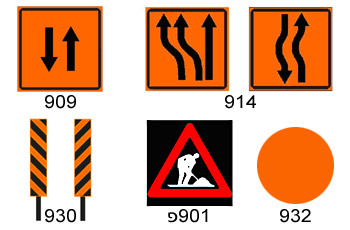 What do the following traffic signs have in common? They are posted in freeways only. They are posted in work sites only. They are posted in inter-urban roads only. They are posted in urban roads only. 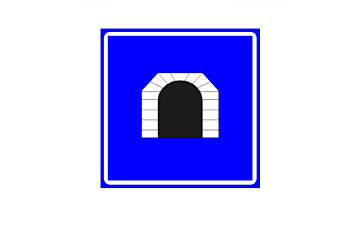 End of vehicle parking and stopping zone. 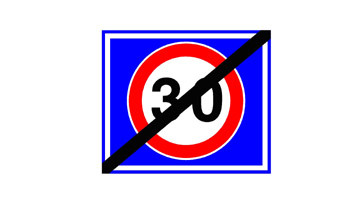 End of “restriction for driving-instruction".